I’ve always wanted to go to an all-inclusive resort in the Caribbean or Mexico, but haven’t since our dog, Bodie, always comes with us when we travel. I had checked into options for Jamaica – a popular area for all-inclusive resorts – but found out that dogs (and other pets) are forbidden to even enter the island. So on a whim, I looked into Mexico – and lo and behold the Xpu-Ha Palace Resort allows dogs! It is the first of its kind, that I know of. 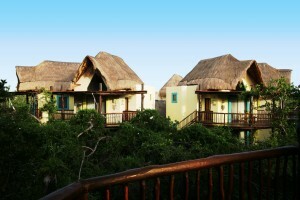 The Xpu-Ha Palace is an eco resort – all the rooms are located in what looks like treehouses. The property is surrounded by lush vegetation, and natural flora and fauna. There’s even a mini zoo on-site. The beach is next to the resort but not its main appeal (from what I’ve read, its been washed away from hurricanes but guests staying at one Palace Resort have the option to use the amenities of other Palace Resorts in the area which are on “better stretches” of beach). Pets (dogs and cats, only. Sorry ferrets!) up to 55 lbs are allowed with a maximum of two per room. The all-inclusive package (which is free for the first pet, and $50 for the second) includes a special pet bed, waste bags for dogs, litter box, pooper scooper and scratching posts for cats as well as grooming. There is also an on-site pet care facility which offers veterinary care, boarding and obedience classes. To read more about the Xpu-Ha and its pet-friendliness, check out my article on Examiner. If you want to find out more information, including rates and availability, please email me! 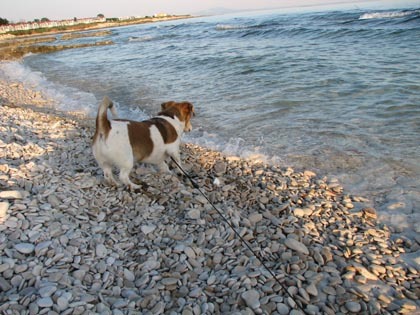 I am a travel agent who specializes in pet travel. This resort sounds fantastic! We’ve never traveled with our dogs to Mexico, but this might be enough to entice us south. I too have looked for all-inclusive resorts that are pet friendly, without much luck. Perhaps St. Thomas? I’ve actually looked into the US Virgin Islands but they don’t have as many all-inclusives as Mexico and some of the other islands (Jamaica has tons but they don’t allow pets on the island). I didn’t find any in the Virgin Islands that allowed pets, anyway. Smaller hotels – yes. The Bahamas is another choice but haven’t had any luck with all-inclusives there that accept pets. If you hear of any, please let me know! Previous post: Pets Need Vacations Too!